We who were there at the National Park in Georgetown, FIFTY YEARS ago, had the privilege of witnessing the Union Jack (the British flag) slowly coming down, as our brand new Golden Arrowhead (the Guyana flag) was slowly hoisted officially, for the very first time, by the then 21 year old GDF Officer, Desmond Roberts. (Desmond Roberts who is now 71 years of age, looks more like 51). A very tall Flag Pole. A very large Flag. A very large audience. But missing is a very large segment of the Guyanese population. The Flag Raising Ceremony at Jubilee Park 2016. The experience at the National Park in 1966 was like magic; like a dream come true: Our hearts pounding in our chests. The pride! The joy! The emotion! The sense of achievement! 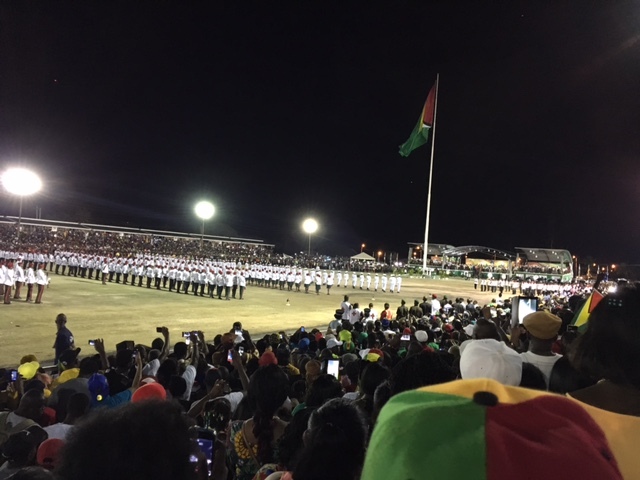 It was not quite the same on the night of May 25/26, 2016, when that jumbo Golden Arrowhead was being hoisted to the top of the tallest flagpole in the history of Guyana. 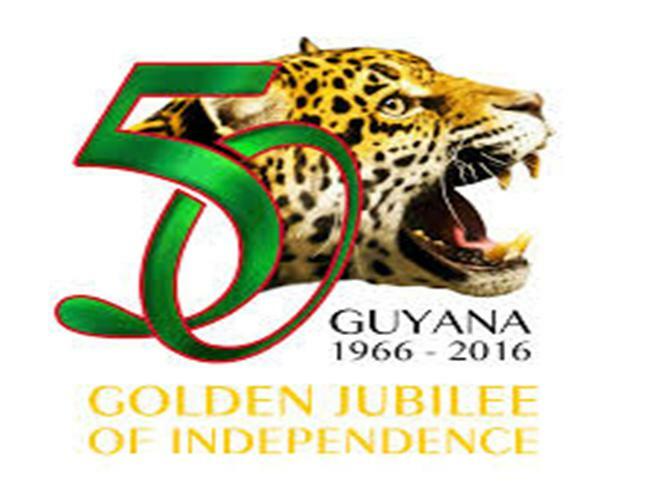 On Jubilee night, 2016, it was the sole flag as it was at the forty nine other Official Flag Raising Ceremonies in the drama of Guyana’s Nationhood. At Jubilee 2016, it was also the LARGEST Golden Arrowhead, in the Nation’s history. 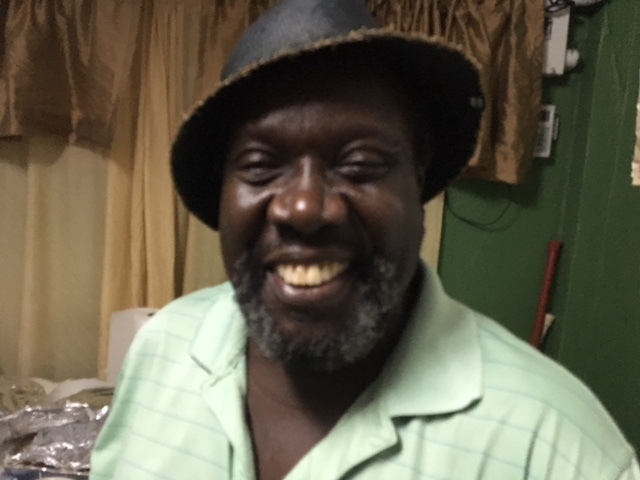 “Florida-Based Radio Personality and actor Ron Bobb-Semple also received shabby treatment by the Ministry of Culture, as was the case with Jamaica-based Eugene Williams. Fifty years ago, as the sun rose majestically on the morning of May 26, 1966, Guyanese felt like a bride on the morning after her wedding; a wedding which took some time and effort to become reality. But there she was, “Oh, Beautiful Guyana, Our Lovely Native Land, more dear to me than the entire world”, now going off on her honeymoon. There were not thoughts of what would unfold fifty days, fifty weeks, fifty months and fifty years ahead. We were now free to run our own affairs, and so we were happy, Extremely Happy, Deep emotions within our hearts. Now, in this Jubilee Year, those of us, like a Married Couple who are celebrating their Golden Wedding Anniversary, there is much to look back to and access how successful those fifty years were, and whether the ‘marriage’ has worked for the betterment of both of the partners; the citizens of this great Nation, irrespective of the many pitfalls which we have all endured. Yes, there were the good times and there were the bad times, but there we were at the Jubilee Park, “JUBILATING” in fine style. Sadly, a large chunk of the Guyanese Citizenry stayed away from that Flag Raising Ceremony. What a shame! What a disappointment! It is not possible for me to know how many of us who were at the Jubilee Park on the night of May 25/26, 2016, had any such deep emotional feelings as was the case fifty years ago at the National Park in Georgetown, when the National Flag was hoisted officially for the very first time. The two events had their own dynamics; one, a NEW beginning, the other, a CONTINUING journey along the Highway of Independence. It is a ‘highway’ filled with many pot-holes. Jubilee Year is still with us and there are still other events in the pipeline; some official others private. Meanwhile, a few of us are already setting our sights on Guyana’s 75th. Independence Anniversary, and hoping that it will be a much greater success than this Jubilee Flag Raising ceremony was. Oh, there were just too many unnecessary flaws! The dramatic walk-out by the Opposition was the worst. I’m not pointing any fingers, but one can safely say that, “All were (NOT) involved” and “All were consumed”, to paraphrase our National Poet Martin Carter’s poem “All are Involved”, which he wrote over fifty years ago. There is a real FACT, however. That fact is, that with the passing of every Guyanese born before May 26, 1966, the number will continue to dwindle to the day when there will be NOT ONE citizen who is now Guyanese, who was once a born British citizen, in the then British Guiana. During the fifteen years when I produced my Radio programme series, The Eighty Plus Club, I interviewed persons who were born in the 1800s. 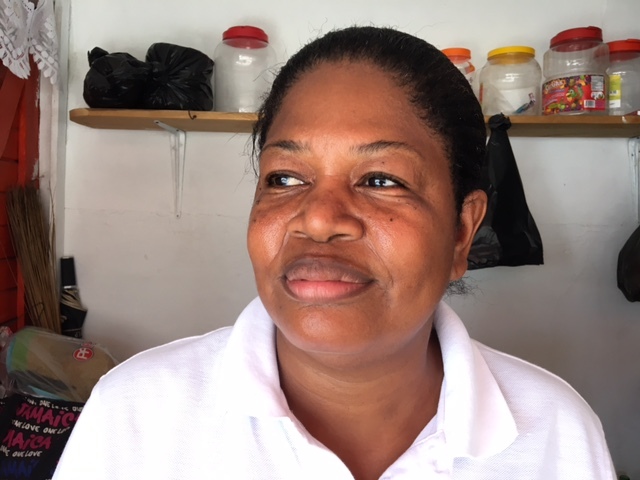 I also interviewed quite a number of persons who were born in India and came to British Guiana as Indentured labourers or children of those Immigrants. I had the honour to interview three of the remaining World War One Veterans at that time. I also interviewed a few persons who lived across THREE CENTURIES – the 19th, 20th and 21st centuries. The most celebrated was Georgetown-born Matilda Lewis who lived up to 113 years of age. They are now all gone to the Great Beyond. In like manner, those of us born in the colony of British Guiana, will someday, be all gone. During the past few months, as the fiftieth Independence Anniversary drew closer and closer, many of us who were old enough to understand what was going on fifty years ago, made plans to do what we felt was appropriate for this very special anniversary. Many residing abroad, made plans to be back home; and back they came. They wanted to be in the Motherland and to be an active part of the Jubilee Party. And what a party it was! However, it has to be said, that there were many things which did not happen, which could have made the celebrations even greater. For example, could you imagine President David Granger and former President (now Leader of the Opposition) Bharrat Jagdeo standing side by side as the super large Golden Arrowhead was hoisted at Midnight at Jubilee Park? Could you imagine President David Granger making a short rousing speech just before the flag was hoisted? And how about Retired Col. Desmond Roberts who hoisted the Golden Arrowhead in 1966, who is now 71 years of age but looks more like 51, also standing proudly at the side of the President and the Leader of the Opposition as the flag was hoisted at Jubilee Park? First Guyanese, Barbara Daniels, who was born on May 26, 1966, was one of those who received very shabby treatment by the Ministry of Culture in Georgetown. And what about those FIRST GUYANESE? – those citizens who were born on May 26, 1966! 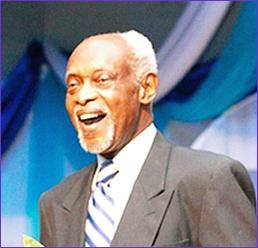 How wonderful it would have been if they were also recognized at the Jubilee Flag Raising ceremony, with a brief moment in the spotlight as Guyana’s greatest bass baritone, David Dewar, sang “Born in the Land of the Mighty Roraima…”? How wonderful that would have been! As a matter of fact, those FIRST GUYANESE were treated very shabbily by the Ministry of Culture. They were initially told that they would be a part of the ceremony, but got the royal push around by the Ministry – “goh back, come back, come back, goh back” – so shameful and disrespectful of these very special Guyanese citizens! After some visits to the Ministry, they realized that their efforts were futile, and so they just maintained their dignity and never went back. With people living much longer now, there is that possibility that some of those FIRST GUYANESE who were born on May 26, 1966, may still be around in 2066, and would probably join in the Centenary Celebrations, as they themselves celebrate their 100 years of life. Hope that they will be treated much better then by the Ministry of Culture of 2066, unlike the Ministry of Culture of 2016. Our FIRST GUYANESE must be treated much better at age 100, than they were at age fifty, at Jubilee Year. Yes, we were privileged to have witnessed the birth of our nation in 1966. I agree that those born on that day should have been given some form of recognition as the first citizens of Guyana. ~ An inevitable and unsettling reality that one day I will no longer be around. What will my legacy be? Yes, I was also one of the first “Guyanese ‘ born on May 26, 1966 . I was in Guyana for my 50th birthday. Note, I did not say 50th Independence as the Ministry who posted a list of all Guyanese who were born on May 26, 1966 to contact them, no longer consider me to be Guyanese as I no longer live there. Too much patriotic gibberish. I am thankful I do not consider myself guyanese, an unfortunate being born into a dirty and ugly housing project masquerading as a country. A place infested with violent and ugly beasts who give you nightmares just seeing their grotesque and distorted faces in the papers. No one brags about being from the projects except for these very brutish,nasty, ugly monsters who glorify their thug existence. Yes, that is how I see Guyana, and is the reason why I never wanted to return and never will. That would be the equivalent of returning to Flatbush, NY after my one nightmare experience. I never did. Who in their right mind returns to such a stinking place out of patriotism and/or nostalgia? Jagdeo definitely did not score any brownie points by attending this jumbie event. He fails to grasp that his base wants nothing to do with this Guyana. We want our very own country. A brand new country – new name, new flag, new culture, new identity. Kinda like how America came into being when it broke away from England. Kinda like what will happen when Scotland does the same, and Catalonia from Spain. I’m citing countries with the quality citizens to make this move a success. The PPP have such supporters to make this move successful. But it will continue to lose them if it insists on ignoring the burning desire of its base. Support a two state separation of Guyana. NOW! You often make me feel very fortunate when I read what you write about your life in Guyana. I could bet you did not go through half the suffering I did. Yet I think I am now at peace. You are fortunate to have the opportunity to make the best of your life in America. Little need to destroy yourself with anger from the past in Guyana. WHO?? Me, Albert?? I am okay, Man!! They tell me it’s only my opinion.